It should have come to no one’s surprise that Ott Defoe found a way to be in contention to win the 2014 Bassmaster Classic. It should also come to no one’s surprise that he managed to notch another top five finish on the sport’s grandest stage. 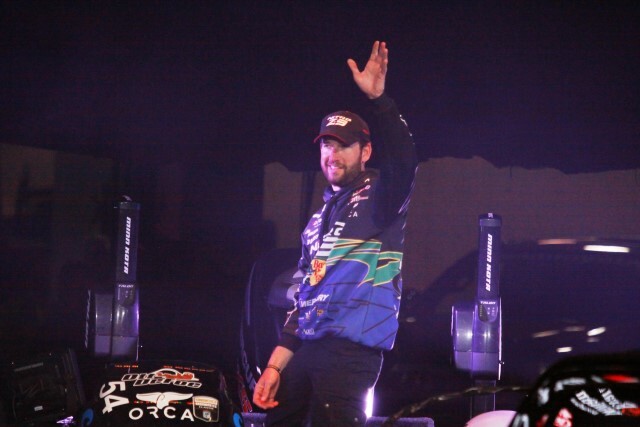 It three trips to the Bassmaster Classic since joining the Bassmaster Elite Series in 2011, the Knoxville, Tenn. pro has been right there each time. Since his first Classic appearance on The Red River in 2012, Defoe has placed in the Elite 12 each time; twice cracking the Super Six. He finished fifth in 2012, 11th last year at Grand Lake, and now fourth last week at Guntersville. But, it’s not just on big stages that Defoe has proven steadfast. While it is slightly misleading because of Classics, where everyone gets a check, Defoe has placed in the money in 36 of his 42 B.A.S.S. entries. Of his 36 paycheck finishes, 28 of those have been in the top 20, 16 in the top 10. 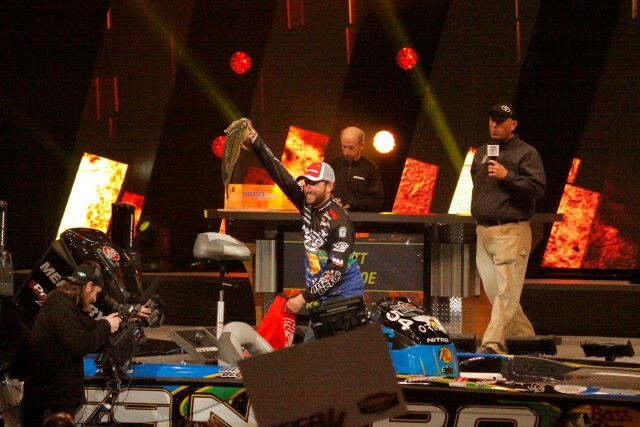 So, it should come as no surprise that he finished the 2014 Bassmaster Classic in fourth place. Only, it may have surprised him a little. Defoe said himself that he did not have a good practice, and that heading into the first day of the event, he had very little to go on. He started the event with one area that he felt that he could catch a few keepers, but nothing that he felt confident about. So, how did he manage to pull it all together like he did? He went In-Depth with us and helped us understand it. Being that he lives in Knoxville, only 180 miles from Guntersville, Defoe has had quite a bit of tournament history on the lake. In his time on the FLW Tour, and in other events, Defoe felt that he had plenty of knowledge of the 75 mile long Tennessee River impoundment to help him locate the kind of fish he would need. His experience on the lake told him that February; depending on the weather, would create one of two scenarios. 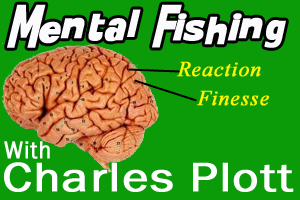 In warming weather, a lipless crankbait around grass clumps would be key, and in cooler weather, bridges and causeways would be the primary pattern. 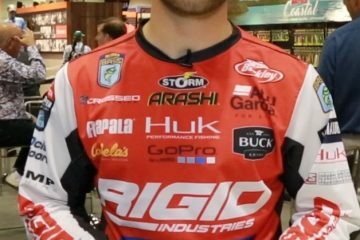 Of course, with castable umbrella rigs being banned in the Bassmaster Classic and Elite Series, he would have to figure out other ways of triggering bites, but he knew largely what to expect. fishing the middle section of Guntersville, and because he didn’t want to overlook anything, he decided to spend a day on the lower end of the lake. He said he got four bites, one of them being a seven pounder, but he still did not feel good about staying there. getting 15 bites, and catching 10 fish, but the problem was that he caught them on six different lures; a crankbait, a jerkbait, a jig, a swimbait and two different lipless crankbaits. While that much variety was not helping him dial in anything, he said he did find a couple areas that had similar components that he was getting bites on; so he felt like he had a couple of areas and the start of a pattern. One of them was a ridge that was 10 to 15 feet deep. he had caught three fish n it, and saw a local catch a big one while he was there. 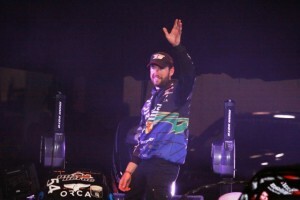 He reported starting in the area of the State Park on the final practice day and while he had no solid production, he was starting to feel more comfortable with where they might go with the expected conditions changes. 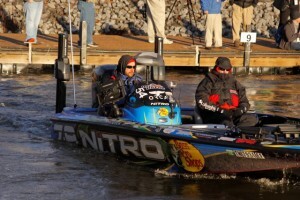 He did find small backwater with clearer water on Sunday’s practice day that held some cruisers in it. Not the kind of cruisers that were tournament winning fish, but some that he felt he could get to bite if he needed a fish or two. The water was clear than the main lake, and he felt like it was an area he should check again. On the official practice day on Wednesday, Defoe said that he went up to Mud Creek to see how much it had warmed with the warming temperatures. While it had not made much of an effect, he did catch a few small fish, but not enough to excite him. He then worked his way out to the main river and decided to fish his way downstream towards the check in. He started getting a few bites shallow, and although they were small, he felt like the fish might start showing up. He managed to catch three fish in that area, though they were not big enough to get excited over. He left and went to the small backwater area he had found on the official practice day. He fished his way in, and caught a fourth keeper after he passed under the bridge. 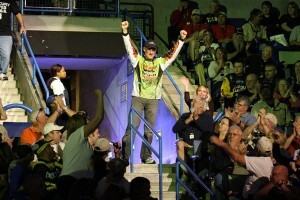 He went through the area, seeing fellow competitor Steve Kennedy while in there. As he was coming back to the bridge, he noticed that the wind was blowing into the bridge, so he decided to fish it a little harder. He threw a crankbait and caught one close to four pounds. He made a few more casts and caught one between three and a half and four, a few more casts produced a four and a half; so, he dropped his Talon anchors and “ripped ’em for close to an hour and a half on the rip rap,” before leaving to head to Goose Pond. Once there, he managed to make a small upgrade towards the back of Goose Pond, then, at 2:20PM, he caught a five and a half pounder before needing to run back to check-in. He said he caught two of the fish he weighed on a lipless crank, one on a Chatterbait, one on a small crankbait and the biggest came on a custom painted Rapala DT-6. 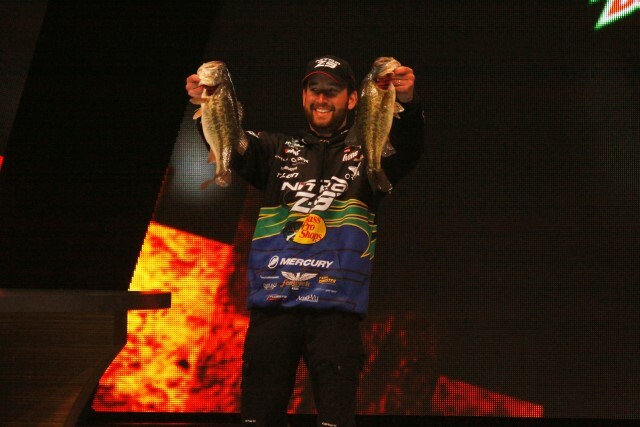 He ended the day with 20 pounds, 10 ounces in 11th place, feeling that he still had a shot, especially with the weights being lower than expected on day one. He went to his day one starting spot but found it too muddy on the second morning of the tournament. After getting two short bites and catching no fish, he returned to the small backwater with the bridge. he worked his way through it, and when returning to the bridge, he caught his first keeper. He made a cast across the rip rap with the DT-6 and caught a 7-pound, 7-ounce largemouth. “I was pretty excited after that fish, so I stayed in the area longer,” he said. “I made the same cast for awhile before moving down the rip rap.” He turned around and backtracked towards the bridge, made a cast from the opposite direction to the spot he caught the seven pounder, and caught a five pounder on the DT-6 again. casts before producing a four-pounder; which was his last fish of the day. He weighed 22 pounds, 11 ounces, pushing his total to 43 pounds, 5 ounces. 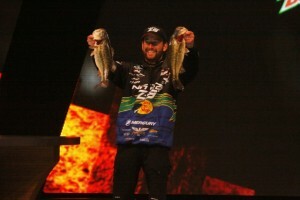 He finished the day in third place, four pounds and an ounce behind day two leader Edwin Evers. He went immediately to his hot rip rap section, but had no wind or current and only caught one small keeper. He ventured into the backwater, but it had cleared too much and though he could see the fish, he could not generate a bite. he even reported picking up a spinning rod to try and make them bite, but said they were too spooky. The first one he stopped on had a small ditch running across it with gravel and milfoil on it. he had a fish knock slack in his line, then threw back and caught a three and half pounder. He fished around it a little more, catching small keeper, then another three and a half and a two and a half pounder. That helped him feel like he was starting to figure things out a little bit, and he had four fish for almost 12 pounds in the livewell. He “fished around” some more, making several stops that produced small keepers. He then saw a spot that “looked good” on his Lakemaster Chip and decided to fish it. It was there he caught an eight pounder on the DT-6; which would be his only cull for the day. His five fish limit weighed 20 pounds, 1-ounce, which brought his total weight to 63 pounds, 6 ounces, good for fourth place. His shad colored jerkbait was thrown on a 6’8″ Fenwick Aetos rod matched with a Pflueger Patriarch and 10-pound-test Berkley Trilene 100% Fluorocarbon. His custom painted Pumpkinseed Rapala DT-6 crankbait was thrown on a7′ medium action Fenwick Elite Tech rod with a Pflueger Supreme and 10-pound-test Trilene 100% Fluorocarbon line. Defoe said that he attributes his tournament to keeping an open mind. “I did not weigh one fish during this event on a spot that I caught fish on during practice,” he said. 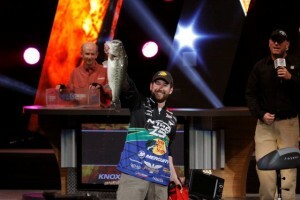 “Every fish I weighed came on something that I found during the event itself. It was a matter of reading the water, looking at my map and fishing the conditions; and I’m pretty excited about how it all came together.